I previously offered an overview of the work of FUNARTE (Fundación de Apoyo al Arte Creador Infantil), the Nicaraguan organization where I am doing an internship as part of the International Youth Internship Program. In my past blog https://walkintherainorgetwet.wordpress.com/2013/09/02/my-two-month-anniversary-with-funarte/ , I talked about the methodology of FUNARTE and the scope of its work. As I described, FUNARTE is present across the country implementing its 9 different projects. The array of social issues covered ranges from peace culture and community involvement to cultural identity and gender equity between others. 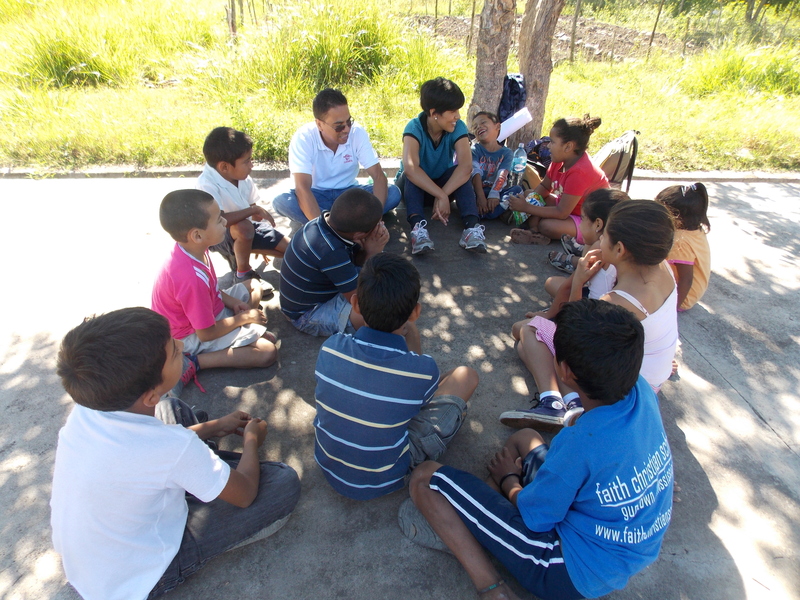 As the core of all projects are, invariably, youth and children´s participation and creative/psyschosocial development. While the work content varies across projects, FUNARTE recognizes the urgency of incorporating gender equity, along with environmental awareness, equality and solidarity, as one of its cross-cutting themes. As the Gender Intern, I have the fortune of working on a project on Prevention of Gender-Based Violence — a pressing issue in the country that continues to take a toll on women’s lives. With gender equity as its work content, the project Arriesg-arte, Involucr-arte, Transform-arte (Risk yourself, Involve yourself, Transform yourself) is now on its fourth year, working with 6 different neighborhoods in the city of Estelí. In a country where gender inequality takes the form of a public health problem as femicide and gender-based violence, women’s empowerment and participation have become a priority in the agenda of both NGOs and government’s institutions. Femicide numbers escalated as high as 47 from only January to July of 2013, reporting a 2% increase from those rates registered in 2012, according to the organization Catholic Women for the Right to Decide – one of the few NGOs in the country that has taken to document violence against women. Gender-based violence and femicide as the most visible and tragic consequences of gender inequality in Nicaragua have offered the urgency to take action on the government’s side. One of the most recent and decisive actions was the approval of law 779. The law was designed to protect women against any form of violence, including domestic, professional, psychological, physical, and economic, sanctioning more harshly aggression in the private sphere or the household with sentences of one to 14 years. Femicide, as the most extreme form of gender-based violence, sentences 25 to 30 years of prison. The law was approved in 2012, and has recently been subject to reform in spite of the loud protests of NGOs and women’s groups across the country. Mediation, as opposed to immediate prosecution, is the new processing dictate for offenders; the measure, according to records from Catholic Women for the Right to Decide, lead to the death of 58 women in 2012. Within the law, a whole administrative strategy is described in detail, highlighting the role of health and legal institutions in simplifying processes, and a judge specifically assigned to cases of women who are victims of violence. It is with law 779 recently implemented and the recognition of gender-based violence as a health and social problem, that Risk yourself, Involve yourself, Transform yourself approaches gender inequality in its work with youth and children. Against the background of a predominantly patriarchal society, the project seeks to reduce violence against women and in the community by tackling deeply rooted notions of masculinity, gender roles and stereotypes, and by promoting women’s participation and access to decision making in solidarity with men. The project follows a social-ecologic model in which family and figures of authority surround youth and children in a dynamic and complex system of relationships. Placing youth and children as its main target group, workshops simultaneously reinforce the agenda with groups of parents, teachers, and community leaders. The total number of participants in the project is 243, with a central target group of 80 teens and children. Neighborhoods with the highest rates of violence and crime in the city of Estelí offered the selection guideline. The areas of work selected were the neighborhoods of Oscar Gamez I and II, Leonel Rugama, Panama-Soberano, La Unión and 9 de Octubre. Risk yourself, Involve yourself, Transform yourself is a 5 year project that is funded by TROCAIRE, the Irish Catholic Agency for World Development. The project follows a carefully planned agenda which covers topics strategically and progressively in bimonthly two- hour workshops with groups of teens and parents — males and female separately — and monthly two-hour workshops with teachers and institutional leaders. Topics and activities covered with different groups complement each other, with the ultimate goal of building a network of protection against gender-based violence in the city. The network-building process offers significant benefits, such as development of self-esteem, awareness of gender inequality in its different forms, improvement of gender relations, community involvement and participation. The project takes into account different levels of participation, and seeks to involve target groups at each level, including family, community, neighborhood and municipality. Addressing gender roles and stereotypes in previous terms, and incorporating subject matter on the law 779, the project has now progressed to promote participation of both women and men involved in the workshops. In its fourth year, the project’s next stage is to conform the network, melding all three groups of teens (female and male), adult men and adult women with teachers and community leaders. The target group is now transitioning into a more active role, disseminating information and preparing to engage in dialogue with other community members and institutions. As part of the gender team, I also participate in the project Equidad y Arte (Art and Equity), working in the neighbor community of Isidrillo with children and teenagers in a rural community. To find out more about both projects Risk Yourself, Involve Yourself, Transform Yourself and Art and Equity, check out my next blog. Wow, it’s very interesting to read about the gender equality issues in this light. It’s definitely a serious issue that needs the attention of these NGOS and governmental bodies. Thanks for sharing your insight on this Julia, and so glad that you’ve had the chance to be a part of such great work being done by an incredibly capable organization! hope it’s o.k. that I used your photo and quote in this post. Loved reading your insights. You might find the two other posts from interns in Africa interesting too. Thanks for your interest and for sharing the blog post. I’m glad to know there’s more info out there, I’ll make sure to share that too.